Sometimes, it’s hard to fit everything you need to do into one day. Running a business is not an easy option and the pressures can be immense. 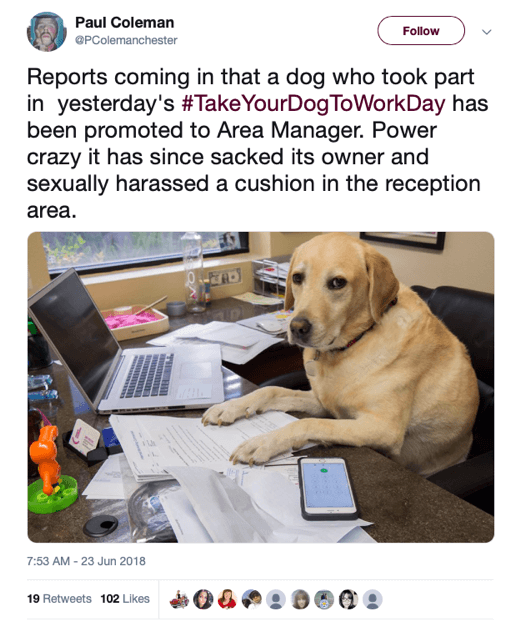 So why on earth would you want to add taking your dog to work, or talking like a pirate, or celebrating National Pizza Day into the mix? It’s an interesting question, yet as we see frequently at The Business Village, many businesses do it. So, what’s the point? Isn’t work just supposed to be about getting the job done? There are people in business who firmly believe that special days are a waste of time, a drain on resources and of no benefit in the day-to-day running of the company. Others see huge opportunities in joining in with them. The real question is, what can special days add to business? We talked about taking part in activities that benefit others and how this is good for employee morale and motivation, in our article on Corporate Social Responsibility (CSR).This is one of the key reasons for injecting a bit of humour and fun into the workplace. Your employees could earn a salary and do their job in many companies; there are specific reasons why they choose to do it with you. A working environment that recognises them as people, not just as a business resource makes a big difference. Making a workplace a positive and happy place, keeps employees motivated and loyal. The other key point to remember is where you hear about these special days… Yep, it’s often via a hashtag or post on Twitter, Facebook, Instagram or LinkedIn, where you’ll find photographs of people having fun at work! This is where you may have had a light-bulb moment… Yes, special days can provide a huge amount of content for your company social media accounts, your blog and even publicity in the local media. You’ll often find that your followers will engage more often with posts involving ‘fun at work’. If you include a hashtag, you can grow your audience, increase your followers and add value to your social media activity. It’s also a great way to reflect your businesses personality, giving customers and potential customers an idea of your company culture and identity. These two posts demonstrate exactly how it works. 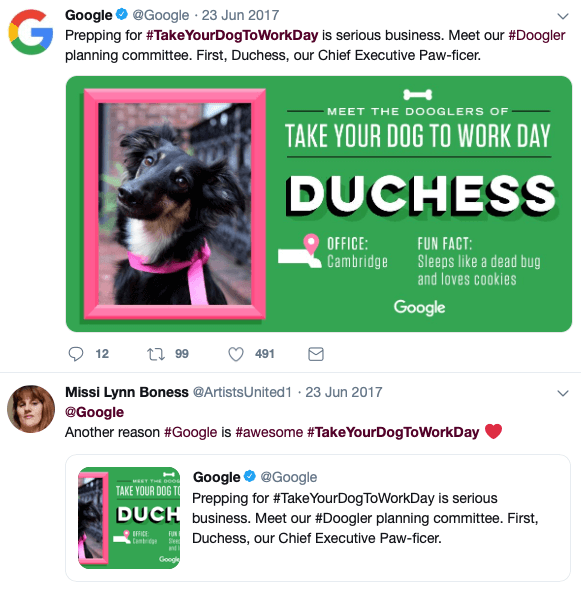 The first, a cheeky post about the owner’s dog in a small business and the second a post by Google. Both have attracted many responses, likes and retweets. The response by a Google follower also shows how the tweet has reinforced positive opinions about the company. Two different posts, one live-post from the day and another that drip-feeds into the concept and sets the groundwork for a series of posts that people may then actively look out for. The best thing is, these sorts of posts can be prepared well in advance and scheduled automatically, lessening the workload for your social media administrator on the day. Special days give you the chance to create eye-catching content that can set the scene for promotions or events within your business. Obviously, you don’t need – nor would you want to – commemorate every special day. That would be exhausting. Do look out for days that are relevant to your business, or employees. It’s important that you don’t just jump on the bandwagon for everything. Blatantly using something that has nothing to do with your business will not create the desired effect. For example, National Pizza Day is a great day for treating your employees to a pizza lunch. Social media posts demonstrate what a great employer you are and how well you treat your staff. Of course, if you run a pizza-related business, it’s the perfect opportunity for a one-day offer. Clean Out Your Computer Day is a brilliant business-relevant day for adding entertaining content. For anyone with a digital business the opportunities are endless! There’s a special day to suit every business and if you use it effectively, it could have a tangible benefit on your business, both internally and externally. Many of the special days hashtags quickly begin to trend on social media, meaning you also have the opportunity to widen your potential audience and drive traffic to your website. Content that drives traffic to your business website is the best kind. But, when people get there, they need to find more engaging content that will keep them onsite and browsing to see what else you have online. Here’s where the opportunities for your blog or news page come into play. Your website doesn’t have to be only about business – nor should it be. Website visitors will get an idea of who you are by the non-business posts. It’s then up to you to convert them effectively, by leading them down the ‘paying customer’ pathway you’ve cleverly created. Our post on Blogging for Business talks about the importance of including both evergreen and time-sensitive content on your website. Articles about special days fall into the latter, but can be used for longer than just one day, if you use them strategically and effectively. So, special days are a great way to create content, drive traffic and engage with your audience, customers, partners, etc. Choose carefully and they will help you to promote your business, create and build your online identity, as well as helping your employees to build their morale and loyalty.